My husband just got home from a trip to China for work. He wasn’t very hungry due to jet lag and traveling, so I whipped up a batch of these mashed potato pancakes with Gruyere, spinach, and bacon for a snack. 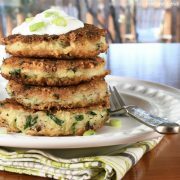 Not only did my husband enjoy these cheesy potato pancakes my kids and I loved them too. Whenever I serve mashed potatoes with dinner, I always make an extra big batch so I can use the leftovers to make potato pancakes. They are always a big hit with my family and I love that you can use whatever ingredients you have on hand. Cook the bacon pieces in a skillet over medium heat until golden brown; remove from pan with a slotted spoon and place onto a paper towel. Drain all the bacon grease from the skillet but don’t wipe clean. Add the shallot to the pan and cook, stirring often, for 2 minutes. Add the chopped spinach and minced garlic to the skillet and cook, stirring constantly, for 1-2 minutes. Remove from the heat. 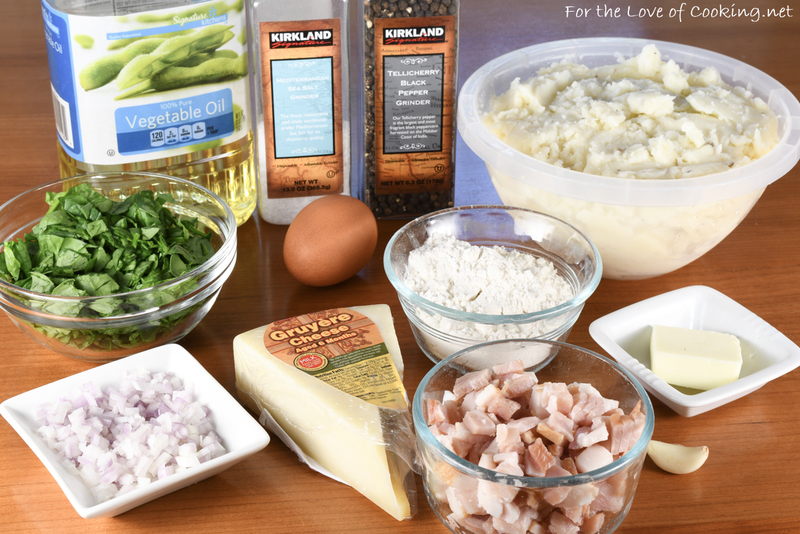 In a large bowl, mix the mashed potatoes, bacon, and spinach mixture until well combined. Add the shredded Gruyere cheese, whisked egg, and 2 tablespoons of flour, and season with sea salt and freshly cracked pepper, to taste. Using your hands, divide the mixture into 8 portions. Roll each portion into a compact ball then flatten into a pancake about a 1/2-inch-thick. Place the remaining 1/4 cup of flour in a shallow plate and season with a bit of sea salt and freshly cracked pepper, to taste. Lightly dredge each side of the potato pancake in the flour. Heat 2 teaspoons of vegetable oil plus 2 teaspoons of butter in a large non stick pan over medium heat. Add the potato pancakes, in batches, until they’re golden brown and crispy on both sides, 3 to 4 minutes. Add the remaining 2 teaspoons of vegetable oil and 2 teaspoons of butter to the pan for the second batch. Transfer the pancakes to a paper towel-lined plate to cool a bit before serving. 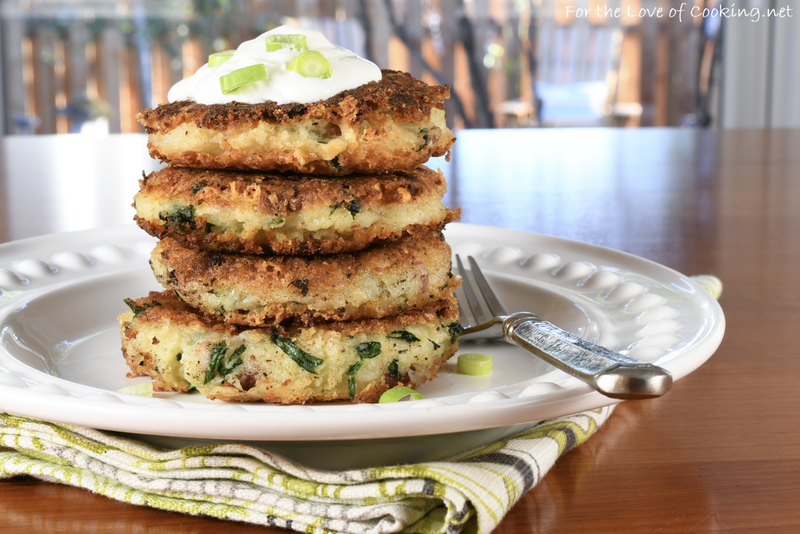 Serve the potato pancakes topped with sour cream and chopped green onions. Side Note: Don’t crowd the pan while cooking and do not flip the pancakes too soon or they won’t develop a yummy crispy crust! Drain all the bacon grease from the skillet but don't wipe clean. Add the shallot to the pan and cook, stirring often, for 2 minutes. Add the chopped spinach and minced garlic to the skillet and cook, stirring constantly, for 1-2 minutes. Remove from the heat. In a large bowl, mix the mashed potatoes, bacon, and spinach mixture until well combined. Add the shredded Gruyere cheese, whisked egg, and 2 tablespoons of flour, and season with sea salt and freshly cracked pepper, to taste. Using your hands, divide the mixture into 8 portions. Roll each portion into a compact ball then flatten into a pancake about a 1/2-inch-thick. Place the remaining 1/4 cup of flour in a shallow plate and season with a bit of sea salt and freshly cracked pepper, to taste. Lightly dredge each side of the potato pancake in the flour. Add the potato pancakes, in batches, until they’re golden brown and crispy on both sides, 3 to 4 minutes. Add the remaining 2 teaspoons of vegetable oil and 2 teaspoons of butter to the pan for the second batch. Transfer the pancakes to a paper towel-lined plate to cool a bit before serving. 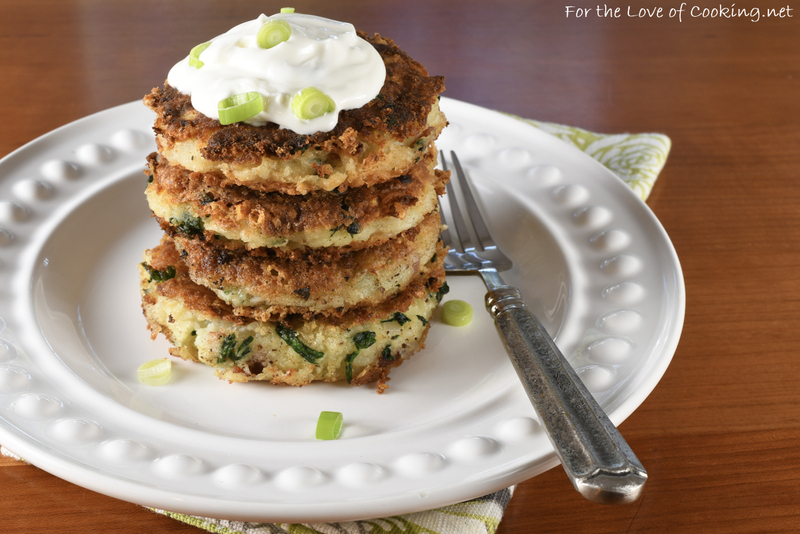 Serve the potato pancakes topped with sour cream and chopped green onions. They look yummilicious and I would love these cheesy crusty potato cakes too. looks and sounds absolutely delicious ! What a delicious way to serve potatoes. Great recipe Pam. All I needed to know was cheese! Then you added bacon! These look wonderful. I’m sure your husband was happy to be welcomed home with some comfort food.